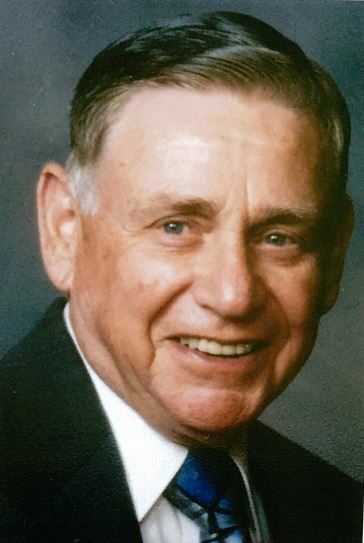 Willard R. (Stormy) Banman age 85, passed away April 9, 2018 following a brief illness. Willard was born Nov. 9, 1932 in Goessel, KS, the son of John F. and Anna (Schmidt) Banman. Willard returned to the area in 2001 after retiring from teaching Health Sciences at Lakeland Community College for 29 years in Mentor, OH. During his professional career he also worked at Michigan State University and the University of Evansville. His hobbies included walking, gardening (both vegetable and flowers) and working on his farm land near his childhood home in Goessel. He also enjoyed restoring vintage cars and tractors. His favorite restore was the Ford Thunderbird having restored a 1960 and a 1965 model. He was a member of the Mid-Kansas Vintage Thunderbird Club and the Vintage Thunderbird Club International. He is survived by his wife of 60 years, Shirley A. (Blosser), children Jacque Banman of Houston, TX, Mike Banman (Harriett Akins) and granddaughter Madison Akins-Banman of New Albany, IN; siblings Kenneth (Bonnie) Banman of Scottsdale, AZ and Julia (Don) Rexer of Hendersonville, TN along with numerous nieces and nephews and a great niece. Willard was preceded in death by his parents John F. and Anna (Schmidt) and older brother Merlin. A memorial service to celebrate Willard’s life will be held Sat. April 14, 3:30 pm at the Alexenderwohl Mennonite Church where he was an active member. In lieu of flowers, memorials may be made to the Alexenderwohl Mennonite Church sent in care of Petersen Funeral Home, 215 N. Main, Newton, KS 67114. It is difficult to bury someone you love. Memories are treasures to help you through these sad times. Prayers for your family. Saying goodbye to a parent is so hard. We are selfish in nature since we never want to let them go. Know that the love of Christ will help you through the difficult days ahead. Prayers for you and your family.